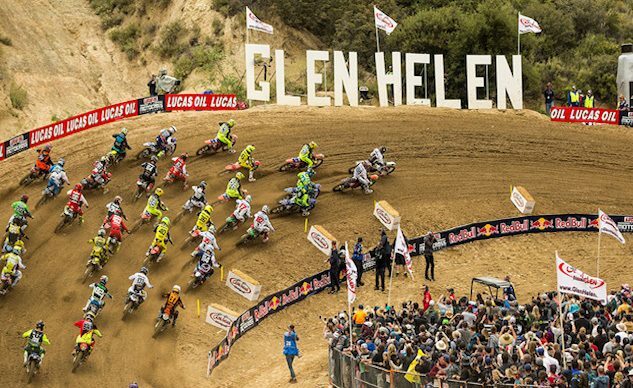 The second round of the 2018 Lucas Oil Pro Motocross Championship at Glen Helen, arguably the world’s mecca of motocross, definitely gave the fans something to cheer for. In the first moto of the premier class, Honda HRC’s Ken Roczen led the majority of the race, but ultimately succumbed to the hounding Eli Tomac. For once, since 2016, spectators saw the two fan favorites duke it out, and Roczen proved that he isn’t done racing yet! In more recent outings, Kenny has been reluctant to put up much of a fight (understandably so, considering his recent injuries) and has more so only tried to survive. But this time around, Roczen was competitive and on the gas with a clear track ahead of him. 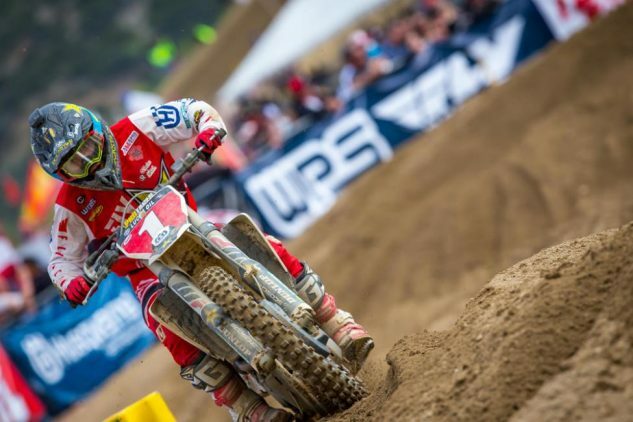 Tomac ultimately went 1-1 and Roczen 3-8 for first and fifth overall finishes, respectively. The 250 class also brought race fans excitement, with all the top guys dicing it up and swapping positions with each other, but Aaron Plessinger clearly looked the most comfortable out there, taking home 1-1 finishes and the overall. Zach Osborne showed plenty of fight, but the defending champion just didn’t have the same flow Aaron did that day. The two now share the points lead. The season is young and there are a lot of talented and hungry riders, all of which have equal chances of landing on the podium, so it’s still early to start making predictions. Let’s see what happens this weekend in Colorado. SAN BERNARDINO, CA – May 27, 2018 – The Lucas Oil Pro Motocross Championship, sanctioned by AMA Pro Racing, kicked off Memorial Day weekend on Saturday with the Giant RV Glen Helen National, presented by Malcolm Smith Motorsports, from the motocross mecca of Southern California. 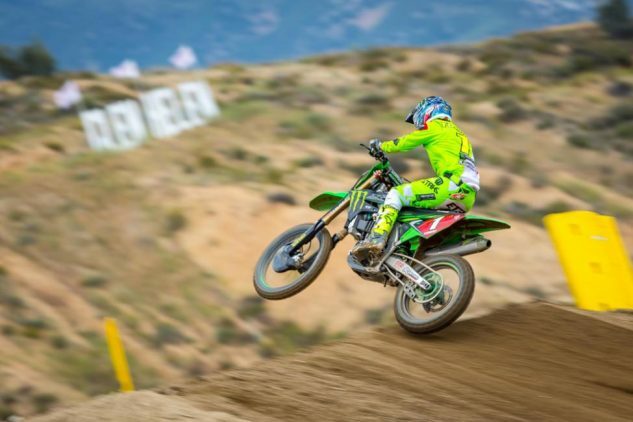 The second round of the 2018 season saw yet another impressive outing from Monster Energy Kawasaki’s Eli Tomac, as the defending champion posted another 1-1 effort to open the season with back-to-back wins. In the 250 Class, Monster Energy/Yamalube/Star/Yamaha’s Aaron Plessinger showcased impressive dominance and moved into a share of the point lead following a 1-1 sweep of the motos. When the gate dropped on the first 450 Class moto of the afternoon it was the Team Honda HRC duo of Christian Craig and Ken Roczen who emerged at the front of the field, with Craig earning his second Motosport.com Holeshot of the season. As he led his teammate through Glen Helen’s tough terrain on the opening lap Craig crashed out of the race, handing the lead to Roczen. Tomac, who started inside the top five, was able to make a push into second, followed by RMATV/MC-WPS-KTM’s Benny Bloss and Rockstar Energy Husqvarna Factory Racing’s Jason Anderson. 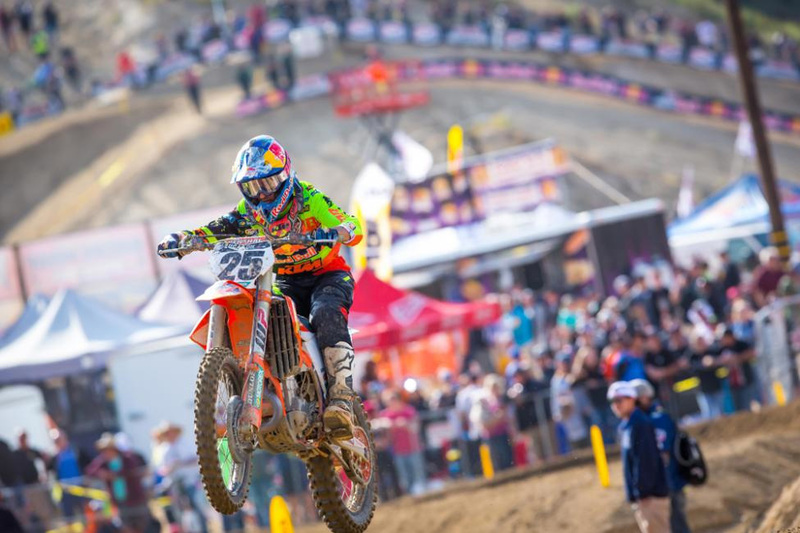 Roczen and Tomac were able to sprint out to a lead, while Anderson soon settled into third ahead of Team Red Bull KTM Factory Racing’s Marvin Musquin, who passed Bloss for fourth. After missing all of last season with an injury, Roczen successfully led his first laps of competition since the final round of his championship-winning 2016 season. 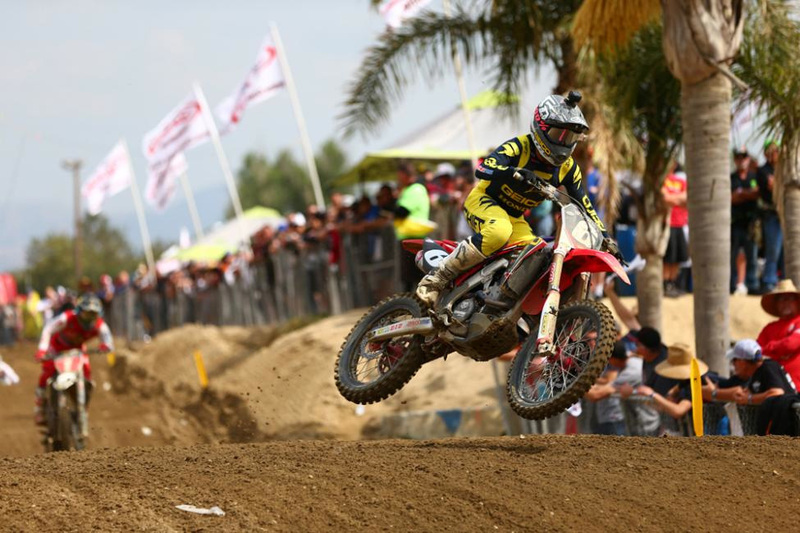 Tomac kept pace with the Honda rider, and the pair were able to clearly assert themselves at the front of the field. Tomac eventually closed in on Roczen and began to apply heavy pressure. He made several pass attempts by trying alternate lines, but Roczen successfully answered every challenge. This battle waged on for more than half of the moto. As the leaders continued their fight, Musquin was making his own push to the front and moved into podium position by passing Anderson on Lap 6. On the following lap Tomac’s persistence finally paid off as he slipped under Roczen and never looked back. Once out front Tomac easily pulled away, while Roczen was left to deal with a hard-charging Musquin. The defending Glen Helen winner needed just a few laps to pass the former champion, taking control of second in the waning stages of the moto. 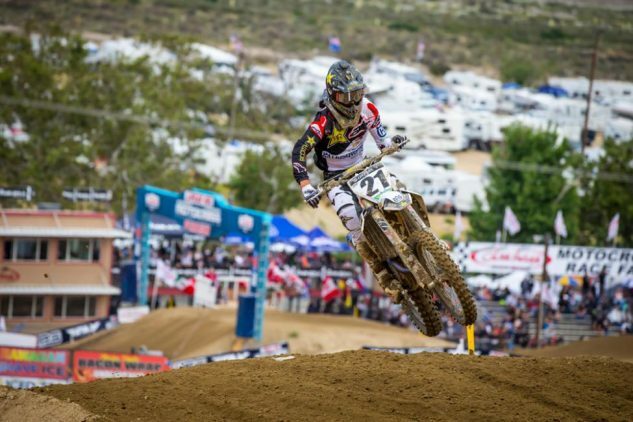 Tomac cruised to his third straight moto win, 12.2 seconds ahead of Musquin. Roczen parlayed his stellar start into a third-place finish, with Anderson fourth and RMATV/MC-WPS-KTM’s Blake Baggett fifth. The second moto saw Anderson storm to the Motosport.com Holeshot and lead, with Musquin and Baggett close behind. Baggett went down as he attempted to pass Musquin for second and dropped to the tail end of the field, which allowed Musquin assume the position. The Autotrader/Yoshimura/Suzuki Factory Racing pair of Phil Nicoletti and Weston Peick slotted into third and fourth, with Tomac fifth. Roczen encountered misfortune on the opening lap and was forced to receive attention from his team in the pit, which ultimately took him out of contention for the overall podium. Peick and Tomac both made quick work of Nicoletti, and Tomac then moved past Peick for third on the following lap. He faced a deficit of more than 10 seconds to the leader at this point. Anderson was able to lay down a torrid pace in the opening laps and opened an early multi-second lead on Musquin. Tomac methodically chipped away at the gap to Musquin and didn’t face much of a challenge when he caught and passed his KTM rival on Lap 7 to take over second. Just over eight seconds sat between Anderson and Tomac when the defending champ moved into second. Tomac continued to post the fastest lap times on the track, but Anderson was able to pick up his pace and minimize the time lost. Tomac’s relentless pursuit of the lead got Anderson in his sights with two laps to go as just 2.7 seconds separated the top two. The Kawasaki rider proceeded to erase that entire deficit and storm into the lead that same lap. Tomac went on to lead just two laps of the moto, but he successfully earned his fourth straight moto win, surging out to 16 seconds ahead of Anderson at the finish. It’s the second time in his career that Tomac has opened the season with back-to-back wins, also doing so in 2015. Musquin finished second overall (2-3) for the second straight race and extended his current podium streak to seven rounds dating back to last season. Anderson claimed third (4-2). Tomac added to his lead in the 450 Class standings and now sits 14 points ahead of Musquin. 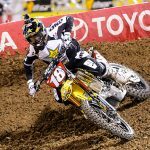 Anderson and Monster Energy/Yamaha Factory Racing’s Justin Barcia sit tied for third, 27 points back. The first 250 Class moto of the afternoon got underway with Rockstar Energy Husqvarna Factory Racing’s Zach Osborne earning the Motosport.com Holeshot, only to lose the lead to Grindstone Compound KTM’s Gage Schehr. Schehr was able to maintain a hold of the early lead while Plessinger surged past Osborne into second. Plessinger then set his sights on Schehr and successfully took over the lead just prior to the completion of the opening lap. 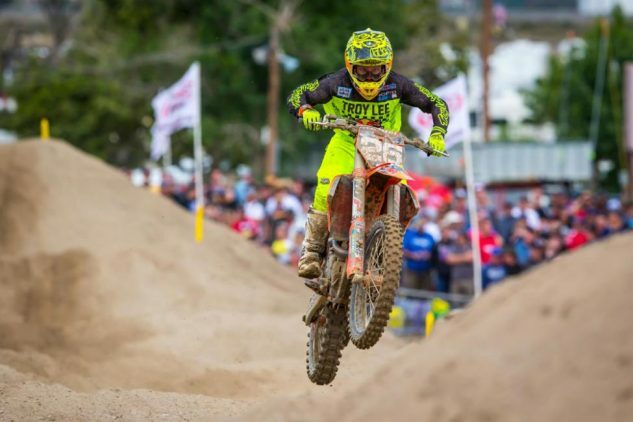 Schehr continued to lose ground and soon lost second to Osborne and eventually dropped out of podium position when Troy Lee Designs/Red Bull/KTM’s Alex Martin moved into third. From there the top three riders settled into their positions and gradually began separating themselves from the rest of the field. As the moto wore on, Plessinger and Osborne pulled away from Martin and soon enjoyed an advantage of more than 20 seconds. Osborne picked up the pace in the late stages and had Plessinger within striking distance with two laps to go. However, he tucked the front end of his Husqvarna and tipped over. That allowed Plessinger to open a comfortable margin, while Osborne remounted without losing a spot. 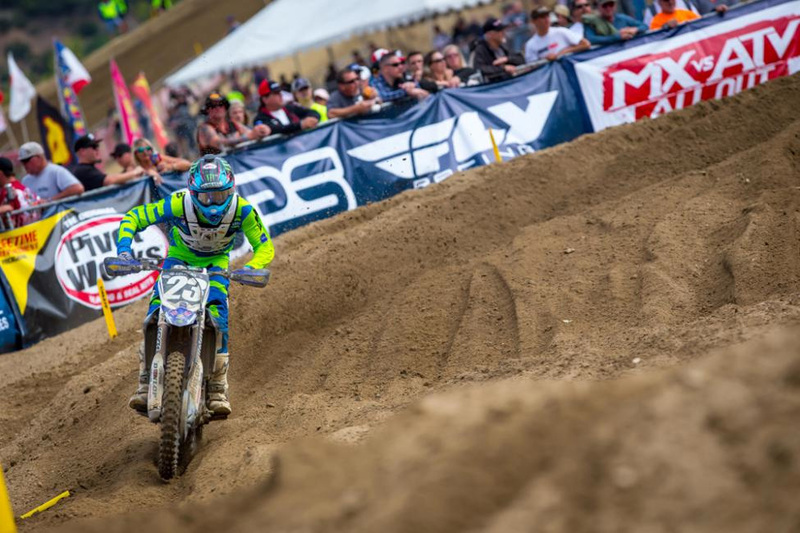 Plessinger took his first moto win of the season just over 12 seconds ahead of Osborne, while Martin followed in a distant third. Monster Energy/Yamalube/Star/Yamaha’s Justin Cooper was fourth, with GEICO Honda’s Jeremy Martin fifth. The deciding moto began with Alex Martin grabbing the Motosport.com Holeshot, with the Monster Energy/Pro Circuit/Kawasaki tandem of Austin Forkner and Joey Savatgy in tow. Behind the top three was Jeremy Martin, Plessinger and Osborne. The clear track allowed Alex Martin to open a gap on the field, while Forkner settled into second. Savatgy came under fire from a slew of riders and dropped from third to sixth as Jeremy Martin jumped to second, Plessinger third, and Osborne fourth. Osborne then attempted to get around Plessinger for third, but the Yamaha rider withstood the challenge and set his sights on Martin for third. He made short work of the Honda rider to move into podium position, and then passed Forkner for second on the same lap. It wasn’t long before Plessinger was hounding Alex Martin for the lead. As that unfolded, Jeremy Martin and Osborne both got around Forkner to take over third and fourth, respectively. After applying heavy pressure on the KTM for a couple laps, Plessinger made the pass for the lead on the run up legendary Mt. Saint Helens. His unrivaled pace quickly carried him to a comfortable multi-second margin over the field, while the Martin brothers and Osborne continued to get closer to one another in an impending three-rider battle for second. 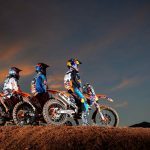 The three riders continued to trade bursts of momentum throughout the course of the moto, with seemingly continuous variances in the gap between them. As he attempted to apply pressure on Jeremy Martin for third late in the moto Osborne lost control of his Husqvarna in the rollers section and crashed out of fourth. That allowed Savatgy to get by and dropped Osborne to fifth. Shortly thereafter, the Martin brothers battled for second, with Jeremy getting the upper hand on Lap 10. Out front Plessinger rode unchallenged to cap off a 1-1 sweep, and backed off on the final lap to finish just 1.4 seconds ahead of Jeremy Martin, with Alex Martin third. Savatgy was fourth, with Osborne fifth. 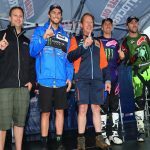 Plessinger earned the third overall victory of his career, with Alex Martin in the runner-up spot (3-3). By virtue of the pass on his brother, Jeremy Martin claimed the third and final spot on the podium (5-2) via a second-moto tiebreaker over Osborne (2-5), which ended a 10-race podium streak for the reigning 250 Class Champion. Plessinger now moves into a tie with Osborne for a share of the point lead in the 250 Class standings. Jeremy Martin is six points back in third. 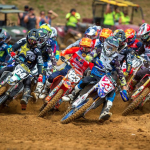 The 2018 Lucas Oil Pro Motocross Championship continues next Saturday, June 2, with its annual visit to the mile-high altitude of the Denver area at Thunder Valley Motocross Park in Lakewood, Colorado. First motos of the True Value Thunder Valley National, presented by Toyota, can be seen live on MAVTV at 11 a.m. PT / 2 p.m. ET, while second motos will air live on NBC Sports Network at 1 p.m. PT / 4 p.m. ET. Additionally, all the action can be seen as it unfolds online via the “Pro Motocross Pass” on the NBC Sports Gold app. Glen Helen Raceway – San Bernardino, Calif.